Tity Boi and his TRU Foundation are spreading the holiday cheer. Here's something to warm your heart. 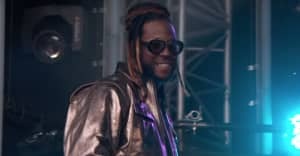 Atlanta rapper 2 Chainz and his TRU Foundation charity are giving back to the community this holiday season, beginning with one well-deserving family in Palmetto, GA. Dierdre Plater, a veteran and single mother, recently underwent surgery and has been job-hunting for nearly a year. 2 Chainz (and his kids!) came and surprised the Platers at their apartment, providing them with furniture and offering to pay their rent for the next year. "It's hard to keep gas in the car, food in the house, and do everything by myself being a single parent," Plater said to CBS 46. "I am on a fixed income. I love to see stuff like this happen for other people, but I never thought it would happen to me." A portion of the sales of 2 Chainz' "Ugly Christmas Sweaters" helped provide for the Plater family, and according to 2 Chainz a section of the proceeds will continue to go towards helping families in need through the holiday season. (And watch the video above if you want to catch young Isaiah Plater hit the cleanest dab ever).